Enjoy a healthy and comfortable sleep with an organic wool comforter from Satara Home & Baby. When you choose us, you can experience the wonders of a wool comforter and get the good night’s sleep you deserve. Why Switch to an Organic Wool Comforter? An organic wool comforter could make the difference in how you sleep tonight. Curl up in bed with our comforters, and get the peaceful slumber you have always longed for. If you have not tried our warm and super comfortable comforters, we give you a few reasons to get one today. Your body may go through the five stages of sleep for about five cycles every evening. However, if you are chilled or over heated, you could wake up right before you enter a deep REM cycle. Compared to all other bedding types, an organic wool comforter helps you gain 25% more regenerative sleep each night. An organic wool comforter is designed to regulate body temperature better than other bedding materials, allowing you to rest more comfortably at night. Wool’s breathability as a filling material makes it cool in the summer and warm in the winter. Standard wool is brittle and scratchy. On the other hand, organic wool is soft and supple because it does not go through a carbonization process. The presence of a small amount of lanolin in our eco-wool and organic wool keeps them supple. If you are allergic to lanolin, you may get a wool test sample before you switch to an organic wool comforter. Wool is fire resistant and acts as a natural fire retardant. An organic wool comforter provides a safe sleeping environment and helps you get to a heavy sleep more peacefully. Wool is a sustainable material that supports the economy and agriculture industry. You can express your support for local farmers when you choose to purchase an organic wool comforter over a bedding made of poly blends. You get your money’s worth when you buy an organic wool comforter because it is designed to last. Whether you use it during the winter or keep it on your bed all year long, it will remain cozy and comfortable for years. If your preference for a comforter is somewhere between a weighty one and a light and fluffy option, an organic wool comforter is your best choice. It has a medium weight that is a bit heavier than down, as well as a slightly dense loft for a cozy blanket feel. This depends on the amount of fill used in the comforter and the fiber’s efficiency in generating dry, comfortable warmth through the evening. An organic wool comforter has the ability to absorb and evaporate body heat and moisture while you sleep. You can enjoy a comfortable sleep without feeling too hot, cold, or clammy. Knowing the right level of thermal warmth that contributes to a healthy sleep environment is important. However, there are other features you should consider when getting a wool comforter. Learn about these factors so you could choose the right comforter for your needs and preferences. Wool comforters are made with layers of fluffy wool batting encased in a cotton cover. It is hand-tufted to keep the fiber in place. A wool-filled comforter has a fluffy loft that appears less puffy than down. Its overall fill may be a bit heavier than other natural materials, but it will not weight you down when you sleep. Compared to other materials, wool does the best job at wicking away moisture from your body. The fiber stays dry and deters dust mites, mold, and mildew. It also significantly reduces the buildup of common allergens. Wool fiber is certified organic or processed without harmful chemicals. It does not have toxic emissions and can greatly benefit the quality of your sleep. Satara Home & Body is a family-owned business that offers a wide variety of products for a better sleep. For more than 10 years, we have been selling natural mattresses and organic bedding of all sizes. View our inventory today, and select the color and style that suits your taste. For your benefit, we have provided tips on how to properly care for the comforter of your choice. If you follow our guide, you can keep your comforter close to its original state years after its purchase. The natural cotton sateen of this organic wool comforter is unbleached and undyed. Its fill is 100% American Dream Wool™ that is grown and carded in the US. Protect this wool comforter with a duvet cover and refresh it in sunlight. You can also spot clean, but remember not to wash or dry clean. The soft sateen cover of this organic wool comforter, which is made using 100% organic cotton fibers, is diamond-quilted to the wool to mitigate wool migration. Get the ideal amount of comfort for sleeping in any of the seasons with this lightweight comforter. This type of organic wool comforter can compare to a high-quality down comforter in terms of warmth and weight. Get this type of comforter to experience exceptional comfort, warmth, and coziness. Keep this comforter protected in a duvet cover when in use. It can also be spot cleaned when needed. Lightweight and warm, this original wool comforter is a very comfortable alternative to down, silk, and 100% wool duvets. Its winter weight is perfect for a cold evening without weighing you down. Organically grown Alpaca fiber is combined with a small amount of sheep’s wool to hold fibers apart, and create more loft, resulting in better insulation. This medium-weight comforter lets you sleep comfortably in moderate northern climates. Sleeptek makes their organic wool comforter with organic materials in Canada, which are certified by the Global Organic Textile Standard (GOTS). Enjoy the sleep benefits of wool during warm weather with this lightweight organic wool comforter. This is perfect when you prefer light to medium cover. This organic wool comforter is made from Merino sheep, which are known for having the finest and softest wool of any sheep. Keep in mind that this comforter is not machine washable. You can dry clean the Merino comforter or protect it with a washable wool cover. What makes this organic wool comforter different? It’s machine washable! It offers all of the sleep benefits of wool without being difficult to maintain. The comforter can be machine washed in cold water on gentle cycle and reduced agitation. Then, it can be air-dried in the dryer with no heat. 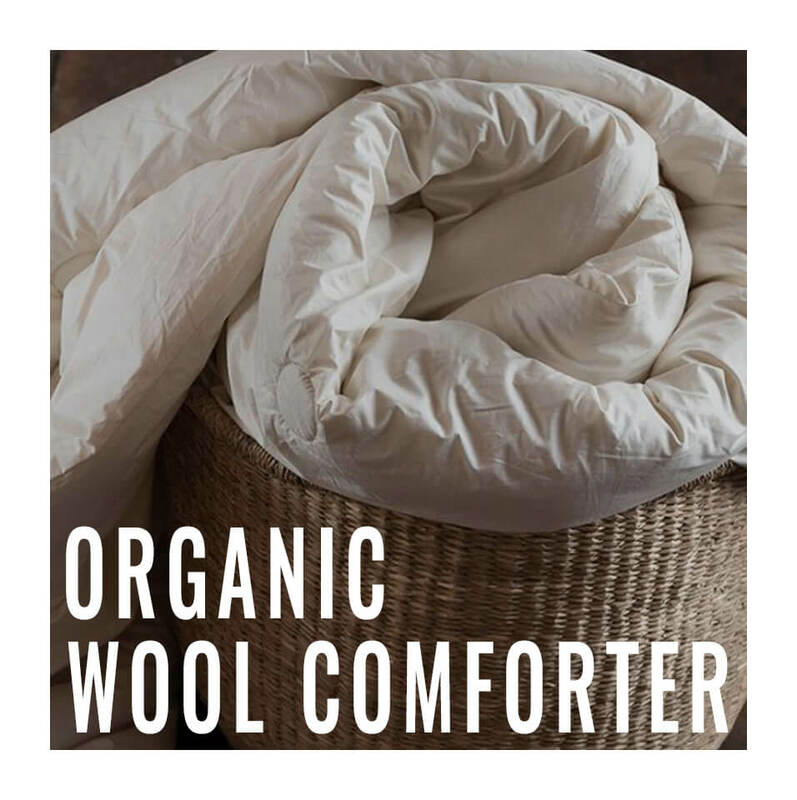 Get the benefits of an organic wool comforter for a reasonable price with this lightweight option. Place it outside in fresh air under the sun to revitalize the fiber. Buy an Organic Wool Comforter Today! Satara Home & Baby offers a great selection of organic products that promote healthy sleep for you and the rest of your family. Browse through and compare the brands we carry to know the different features of our items. We have an expansive inventory, so you find the product that suits your style as well as your budget. To learn more about our organic wool comforter, contact us today at (608) 251-4905. Our team would be happy to assist you to find the right organic wool comforter for each of the seasons.